After nearly 8 months of mentally preparing ourselves for our (now very) imminent arrival, we've finally got round to the actual physical preparation, which let's face it is the fun bit! 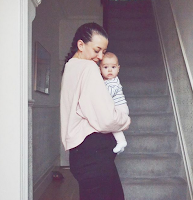 I've slowly but surely been through what feels like every single nursery pin on Pinterest for inspiration and although they are lovely, there was nothing that felt quite right for us so we're going our own way Fleetwood Mac style. This is the very first stage of the nursery but I wanted to document it all the same. It's essentially a functional space where we can get the baby changed, cleaned and fed, but in a few weeks it will be painted and covered in prints and commissioned art to make it completely ours. Thankfully my mum works at a school so gets the summer holidays off work so she's going to come and help me do all the hard work, I won't be up a ladder any time soon, don't worry! 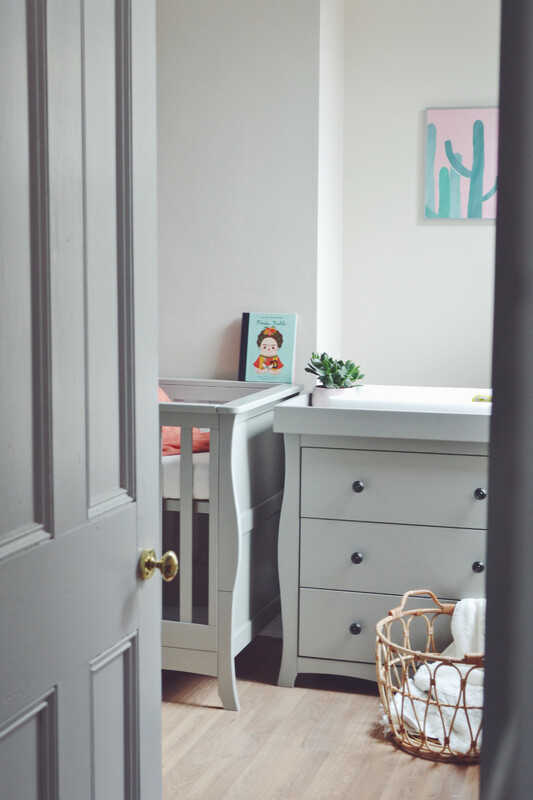 The main area of the room we struggled with was the cot, we weren't sure on the style we wanted and ummed and ahhed over simple, Scandi designs to copper delights. Thankfully I started chatting to the lovely people at Little House furniture who were SO helpful in advising what would work for our needs and we settled on the Brampton cotbed* which they very kindly gifted to us to review. 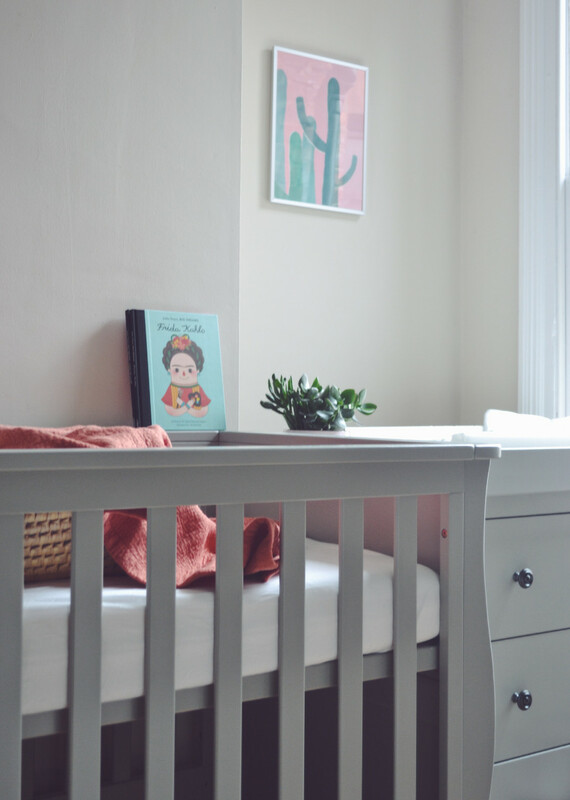 The best thing about this cot is that it grows with the baby and you can adjust it into a bed that is suitable up until the age of 5 which is ideal for what we needed. It's made of solid wood so it's incredibly sturdy and we don't have to worry about anything falling apart after a few months! The colour is perfect too as were not 100% sure on the baby's gender so we're keeping things relatively neutral. 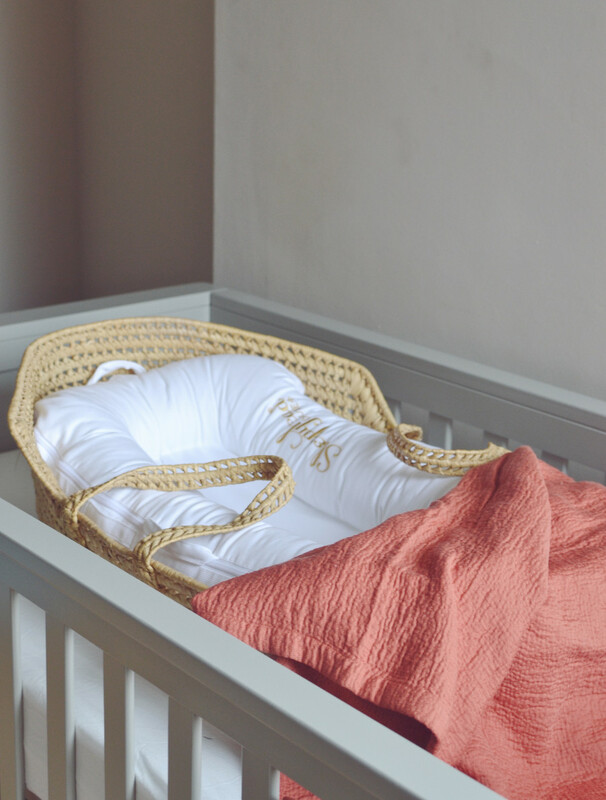 We also have a moses basket that was Joe's when he was a baby which is ever so cute, it's just the kind of style I'd choose too so perfect for us! We have a Sleepyhead ready too as we've had so many recommendations for it, we'll use this in the cot and around the house for nap times. The book was a very thoughtful gift from my friend Kasia which I LOVE. The room itself is thankfully quite big (though currently is half filled with boxes that need to go up to the loft...) so has plenty of space for us to expand into. At the moment I've only focused on getting the key areas sorted - the cot and and the changing table - ready for our new arrival, but we're planning to get a sofa bed and already have a TV and a Sky box in there so I we have a good set up for late night feeds and family time. The baby will be in our room for quite a few months anyway so we have plenty of time! The colour palette I'm planning is terracotta, navy, green and grey. 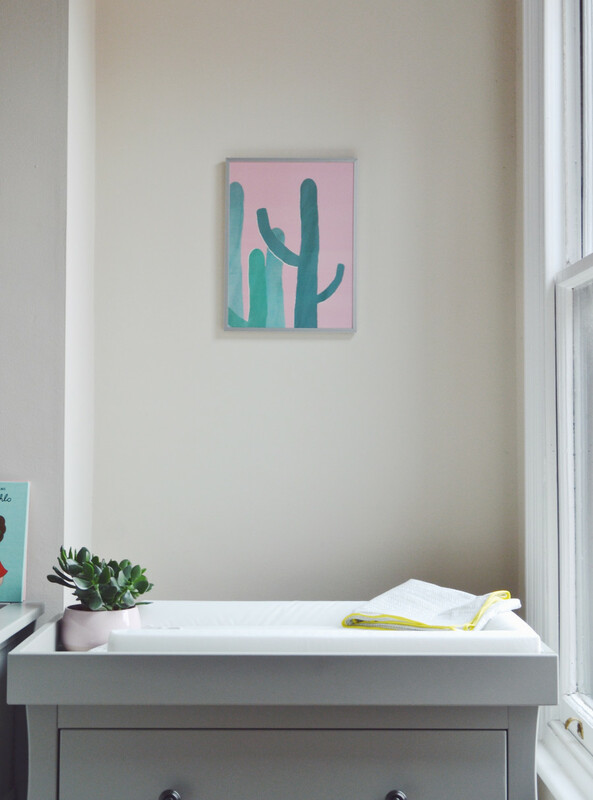 We only have the one cacti print up at the moment which I got in the Olli Ella sale (it's still available and only £12), but there are plenty more to add to make a colourful gallery wall full of personality. I've also picked up a rug from Wayfair that should be big enough for plenty of wriggling around on when the baby is a bit older. 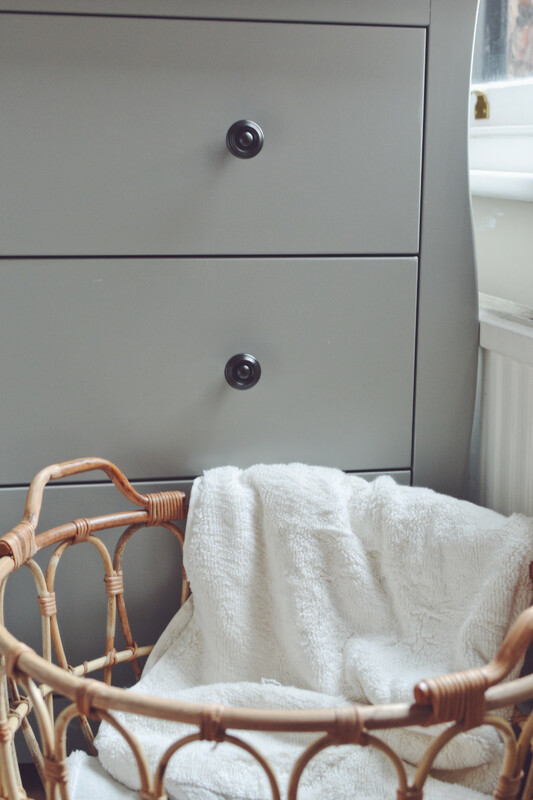 The changing unit* is also from Little House furniture and is another magic piece of furniture, as the top comes off and it's just a set of drawers instead of a changing table. It's solid wood again so is incredibly sturdy and ready for plenty of wear and tear. It's already full of tiny clothes and a lifetime supply of baby wipes! 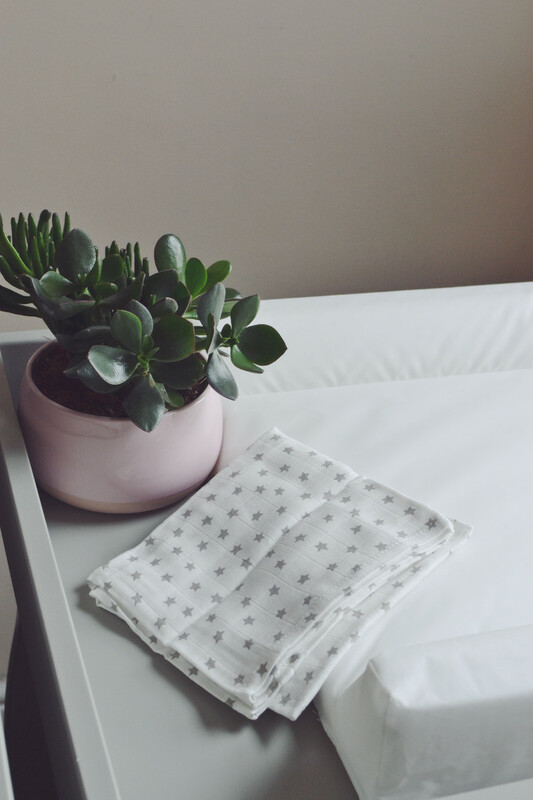 I've added a plain IKEA changing mat (I still need to find some covers though) as well as some muslins and a little plant to brighten it up, I'm sure the plant won't last very long there when we get into proper parenting but it looks nice for now. I'm planning on getting a big plant, rail, a lamp and shallow shelves to go behind the changing unit as the radiator means it doesn't quite fit flush to the wall. We also have a few wicker baskets from IKEA dotted around ready for washing to be thrown into and for extra storage, so far we only have some beautiful Christy towels and IKEA hooded towels ready to go but after a day of nesting and washing all the new clothes, we'll be good to go. I need to order a blind for the window too and we'll probably get curtains as well to make sure it's extra dark is the evenings will still be quite light when they baby arrives. 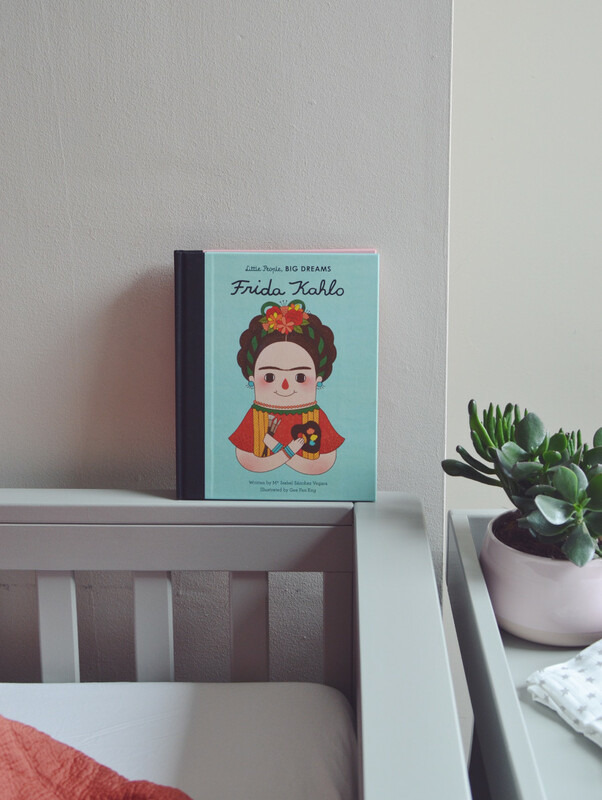 I'm now on maternity leave (I'm not 100% sure how I feel about this yet but will be writing a blog post all about it next week when I've got my head round it more) and I have quite a few craft projects to work on for finishing touches, one of which is to make a bed canopy (a little like this one) with some gorgeous grey William Clark linen I've had waiting to be made into curtains for about a year. I'll post more updates as the room develops so keep an eye out for new posts! 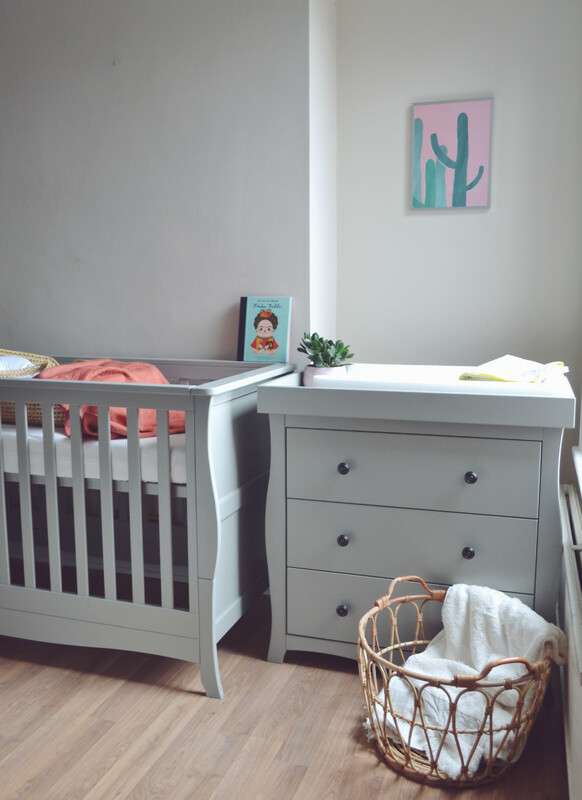 *The lovely people at Little House Furniture gifted us the cotbed and the changing unit in return for an honest review, all opinions are my own. Check back in a few months for more information once we start to use them fully!